As announced last month, an update to RSS client Reeder for iPhone has been released today on the App Store, adding support for Feedly and Feed Wrangler. Arriving just in time for Google's shutdown of Reader, the latest Reeder update for iPhone brings the app's supported sync services to four (previously added Feedbin, Feedly, Feed Wrangler, and Fever) and removes Google Reader from the "Add Account" screen (existing accounts won't be deleted from the app). 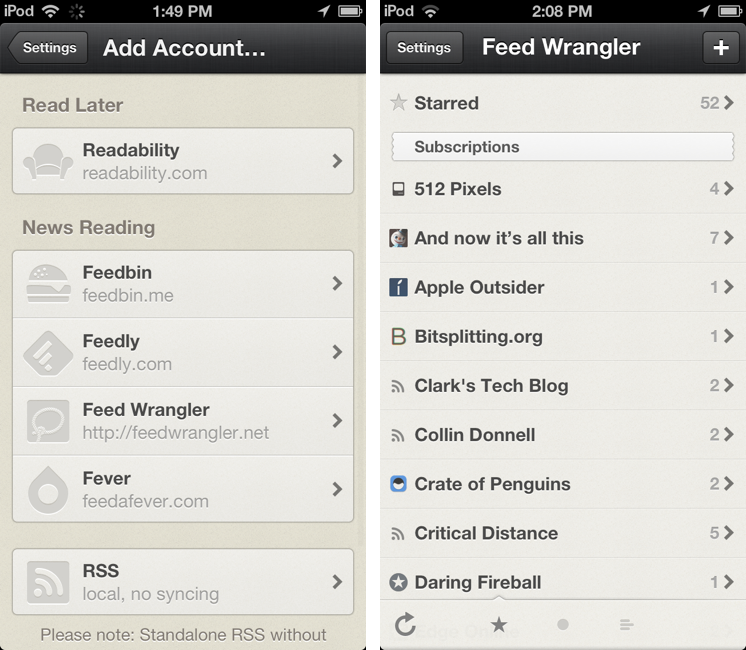 Feedly and Feed Wrangler integration in Reeder is solid, but it lacks some features. While I have been generally happy with Reeder's speed in syncing with Feedly and Feed Wrangler, the app lacks support for Smart Streams -- a key functionality of Feed Wrangler that's already supported by clients like ReadKit and Mr. Reader. To access Smart Streams on the iPhone, my recommendation still goes to Feed Wrangler's official app, which may not be as polished as Reeder, but that works perfectly with the service's Smart Streams. Reeder, a longtime MacStories favorite, is moving into the post-Reader era with an iPhone update that should work for most people and major iPad and OS X updates on the horizon. Developer Silvio Rizzi hasn't provided a release date yet, but he announced the iPad version will be a completely redesigned app. Due to the lack of compatibility updates, both Reeder for iPad and Reeder for Mac have been removed from the App Store.